14" delicious heart shaped chocolate chip cookie cake. Tell us your message and we will spell it out using our delicious hand molded chocolates. Custom design this cake. let us know what colors etc. We can even add an edible photo image. What a great way to say "I Love You"
Our Amazing 12" (1.5lbs) Chocolate Chip Cookie Cake decorated with your photo (or any other image). We can add a message as well. Email us any photo, and we will make it completely edible. This unique technology lets us put virtually anything on a cookie cake. HOW DO YOU GET US YOUR IMAGE??? AFTER PLACING YOUR ORDER, YOU WILL BE SENT AN ORDER CONFIRMATION. SIMPLY REPLY TO THE ORDER CONFIRMATION EMAIL WITH YOUR IMAGE AS AN ATTACHMENT. Use this box to type in and tell us what "theme" and colors you would like. GIFT CARD (included in price): Use this box to tell us what to write on a gift card. Need it now or later? Date Required*: Replace "Date Required" with your preferred approximate arrival date. Keep in mind the transit time of 2-3 days begins when the order is processed (orders are processed within 24 hours). During checkout, choose the appropriate shipping method to meet your arrival date. For in store pickup please note date as well as the time required. 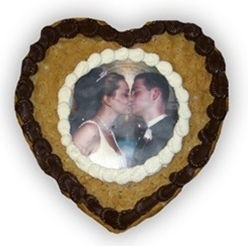 14" delicious heart shaped chocolate chip cookie cake with your completely edible photo. What a great way to say "I Love You" in a very personal way.